Perhaps the most dramatic societal shift over the past 100 years has been the evolution of women and the blurring of traditional gender roles—in homes, in schools, and in the workplace. This transformation has had tremendous and far-reaching impact—one that not only affects women, but also their partners, their children, and the world economy as a whole. This area of study has long fascinated Susan Averett, Charles A. Dana Professor of Economics, who has made it a focal point of her research and teaching within both the economics department and women’s and gender studies program at the College. And so when Oxford University Press decided to produce an in-depth handbook devoted to examining women’s impact on the economy, editors at the prestigious publisher approached Averett. Averett accepted the role of co-editor, undertaking the responsibility with two collaborators, Laura M. Argys, professor of economics and associate dean for research and creative activities at University of Colorado, Denver, and Saul D. Hoffman, professor emeritus of economics at University of Delaware and visiting professor of economics at University of Colorado, Denver. Their completed work—The Oxford Handbook of Women and the Economy (May 2018) —is the first comprehensive handbook focusing on the economic lives of women over the past century. Some of the essays take an interdisciplinary angle, including research about gender from biology and other disciplines. This is reflective of Averett’s own interdisciplinary scholarship. She has published research linking biology and economics, such as the economic causes and consequences of obesity and the risky behavior of teens. 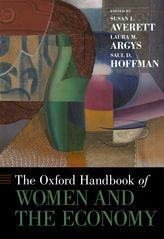 With 32 chapters each covering a separate topic area, The Oxford Handbook of Women and the Economy provides a thorough analysis of women’s role in the economy. However, Averett and her co-editors note that this is just an initial step forward.